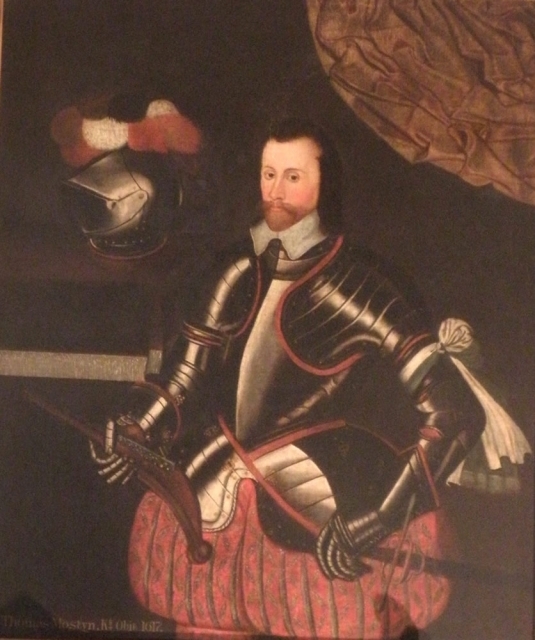 As a Justice of the Peace during the reign of Elizabeth I, Sir Thomas Mostyn (c. 1542 – 1618) was expected to enforce the religious changes of the time, securing the transformation from a Catholic to a Protestant state. In Flintshire he was responsible for dealing with the persistent problem of St. Winifred’s Well in Holywell, the most prominent focus for Catholic resistance in the whole of Wales and north-west England. This survived as a site of pilgrimage throughout the Reformation period. Coincidently, the area around the Gloddaith estate was also a hotbed of Catholicism with much recusant activity focused around the figure of Robert Pue of Penrhyn. In 1587 he and a group of fellow Catholics, including the priest William Davies from Llandrillo-yn-Rhos, were discovered in a cave situated on the Little Orme. Reports suggest that Sir Thomas Mostyn was informed of their activities and went to investigate but would not dare enter the cave, its entrance apparently being too narrow. Instead, he left a watch of twenty loyal men there overnight. By the next morning all the Catholic group had mysteriously disappeared from the cave without the watchmen moving a muscle.